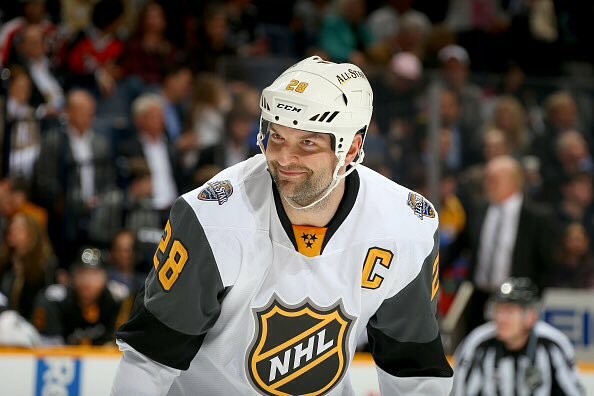 John Scott became the new face off the NHL at All-Star Weekend in Nashville. The fans spoke and voted him in as not only an NHL All Star, not only the top voted player in the Pacific Division, giving him Captain's honors for the Pacific Team, but the MVP of the 2016 NHL All Star Game. A Cinderella story out of nowhere, his talent shows he wasn't supposed to be there. 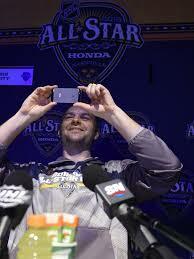 His NHL career spans 7 teams (Wild, Blackhawks, Rangers, Sabres, Sharks, Coyotes, Canadiens) in 8 years. In that time, he has played 285 games with 5 goals and 6 assists, and 542 penalty minutes. He scored 2 goals tonight in the upset game against the Central Division to get to the Championship game. He originally did not want to participate. He knew he didn't belong there. 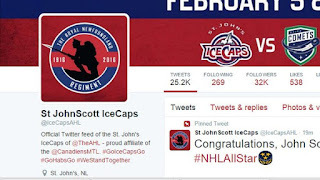 Then the oddity of him being traded from Arizona (who was in the Pacific Division in which he was captain for), ad traded to the Montreal Canadiens, who quickly demoted him to their AHL affiliate, St. John's IceCaps. 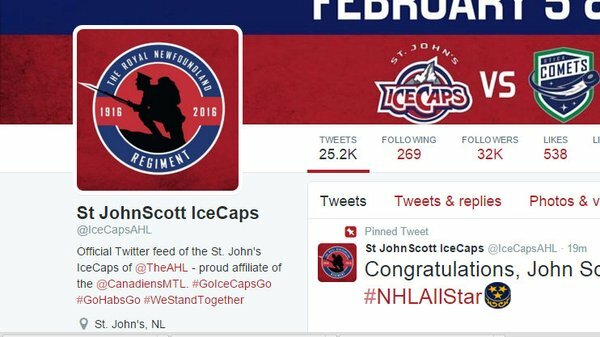 The IceCaps even went as far as changing their name for the night in honor of John Scott's historic weekend performance. Then, through an interview, Scott talked about an NHL Official asking if his family would be proud of him being there. That made Scott change his mind to go to Nashville. He may not belong, but no one questions family. From then on out, Scott would go to Nashville, and the enforcer would take Smashville by storm. Scott arrived in Nashville and was blown away by the attention he received. He even stopped to take a picture of the media interviewing them because he wanted to soak it all in. His role has always been the enforcer. But as everyone got to know him off the ice, he is one of the kindest, "Gentle Giants" you would want to meet. Everyone on his previous teams know it, and now the rest of the NHL knows it as well. 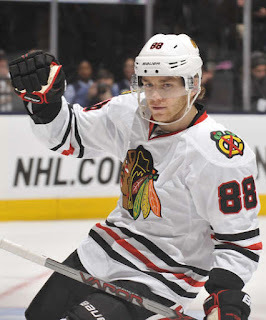 He did manage to get into an "altercation" with an ex-teammate, Patrick Kane. It was a feel good story the entire weekend. Every player stated so. Even those that did not make it to the game, like Henrik Lundgvist, got caught up in the excitement. 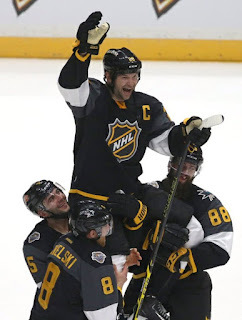 Johnny "Cash" Scott, "Walked The Line" this weekend, not knowing how the weekend would turn out, and he walked out as the "Man In Black" while being carried off on the shoulders of the winning team of the 2016 NHL All-Star Game. Well done, Mr. Scott, well done. 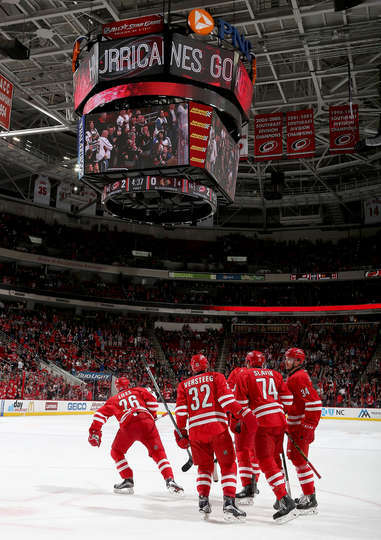 Carolina jumped on the Blackhawks early as Jeff Skinner grabbed a rebound shot off of Corey Crawford and flipped it into the back of the net just 2:12 into the game to give the Hurricanes a 1-0 lead. Riley Nash made it 2-0 later in the period as he deflected a Jaccob Slavin shot that made its way past Crawford. The first period would end with John-Michael Liles joining a 2-on-1 rush and depositing it into the back of the net for a 3-0 Hurricane lead. The Blackhawks were outshot 16-5 in the period. Scott Darling replaced Crawford to start the 2nd period. It didn't help motivate the Blackhawks as the Hurricanes tallied half way through the period when ex-Blackhawk, Joakim Nordstrom snapped a shot past Darling to extend the lead to 4-0. Less than 2 minutes later, Nash would pick up his 2nd goal of the night, to put the 'Canes up by 5 at the end of 40 minutes. The 3rd period was just formalities. There was no scoring. Joel Quenneville couldn't have been happy with the effort his team put forth tonight, but then again, they are atop of the Western Conference. Notable mentions: The Blackhawks head into the All Star Break leading the Western conference with 70 points. Patrick Kane strides into the break leading the league with 73 points, 15 points ahead of the closest competitor, Jamie Benn of the Dallas Stars. Let's hope the boys get some much needed rest, and come back for the remainder of the season strong. The Blackhawks were miserable at the face off dot winning only 20 of 62 faceoffs. The Chicago Blackhawks and the St. Louis Blues faced off for the 3rd time this year, both winning one a piece in the opposing team's house. 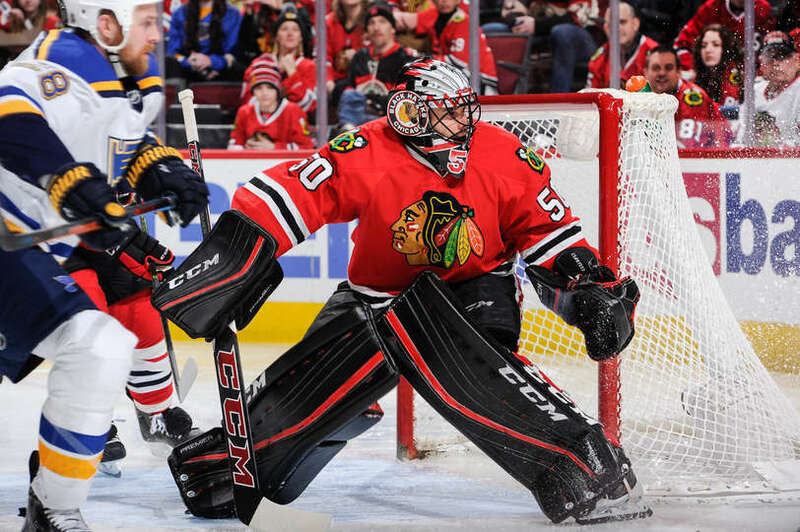 Corey Crawford stood tall in net and earned his 7th shutout of the season as the Hawks took down the Blues, 2-0. The game started like the previous two games have for the Blackhawks. The Blues had a handful of golden opportunities, but fortunately, the Hawks have a guy named Corey Crawford in net that stopped all 12 of the shots he faced in the first period. The Hawks had a couple of chances, but Brian Elliott had a fairly easy 1st, stopping 6 shots. The 2nd period felt like a tennis match where one team would bring the puck down, only to lose it. The other team would then bring the puck down, only to lose it. It went on that way till the 15:26 mark, when Patrick Kane brought the puck over the St. Louis line, flipped a pass to Artemi Panarin, who one-timed it past Elliott to give the Blackhawks a 1-0 lead. Shots were tilted in the Blackhawks favor in the 2nd period, bringing the game totals to 18-17, in favor of the Blues. In the 3rd, the first penalty of the entire game came at the 4:14 mark. When was the last time a Hawks/Blues game went into the 3rd period before having a penalty? ANYWAY, Andrew Shaw would tip a Marian Hossa shot that was going wide, and redirect it into the back of the net to give the Blackhawks a 2-0 lead. From there, the Blackhawks defense and the play of Crawford were enough to hold off St. Louis and give the Hawks a 6 point lead over the Blues. Notable mentions: Corey Crawford, prior to this year, in 268 career games had 12 shutouts. He has 7 in 41 games this year. The Blackhawks have one game remaining before the All-Star break. they've currently played 13 games in 21 days with a 12-1 record. There is a saying, "It's a marathon, not a sprint". This applies to many things including a full NHL season. 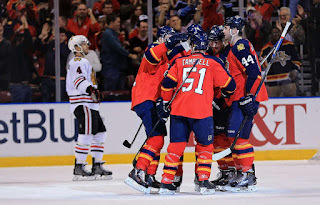 The Chicago Blackhawks did not have a friendly visit to the two teams in Florida this last week. Although the players will never give excuses for their play, let's take a look at a few things that may be factors. First off, let's look at the Eastern Conference Standings. The Florida Panthers and Tampa Bay Lightning are 2 of the top 5 teams in the Conference this year. The Panthers are no longer the pushover team as they once were. For those with short memories, when the Blackhawks were winning their 7th game in a row, the Panthers had won their 12th in a row. As far as Tampa Bay is concerned, we already know they are a good team. Not to mention after getting shutout in Game 6 of the NHL Finals last year, they were also shutout on October 24th of this year at the United Center. A slight revenge factor was eating at the Lightning, who came into the game against the Blackhawks winning 6 in a row. 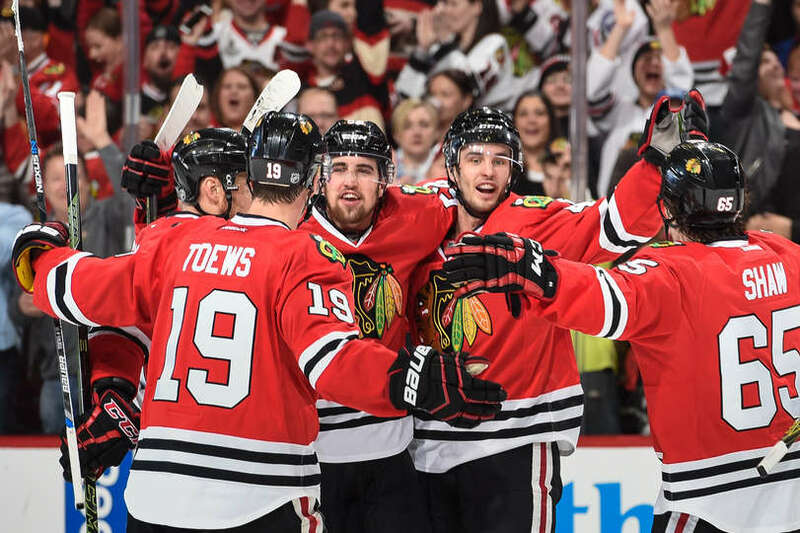 The biggest contributing factor would be that the Blackhawks have played 12 games in the last 20 days, including 3 sets of back-to-back games. Remember the quote, "It's a marathon, not a sprint"? Well, the Blackhawks' schedule doesn't give them the opportunity to catch their breath right now. After Tuesday, they will have played 14 games in 24 days. That average doesn't even give a full day's rest between games in a stretch of 3 weeks where every team in the league wants to beat the reigning Stanley Cup Champions. The two games left of this "sprint" have the St. Louis Blues visiting the United Center tonight and the Blackhawks visiting the Carolina Hurricanes on Tuesday. After Tuesday, comes the much needed All-Star Break. The Blackhawks will get a full week off before they start a 3-game road trip against Colorado, Arizona, and Dallas. For those that are upset about Duncan Keith and Corey Crawford not appearing in the All Star game, I say please refer to the above article referencing the need to rest. Corey Crawford is having a career year and is on pace for personal bests in Games Played, Wins, and Minutes Played. He is a huge reason why the Blackhawks have had the success they have had, especially in their 12-game winning streak (9-0-0, .946 SV%, 1.88 GAA). The argument can be made that he stole 3 or 4 games for the Hawks on that streak. With the amount of games played and minutes he will be playing, he needs to have that rest for the post-season. 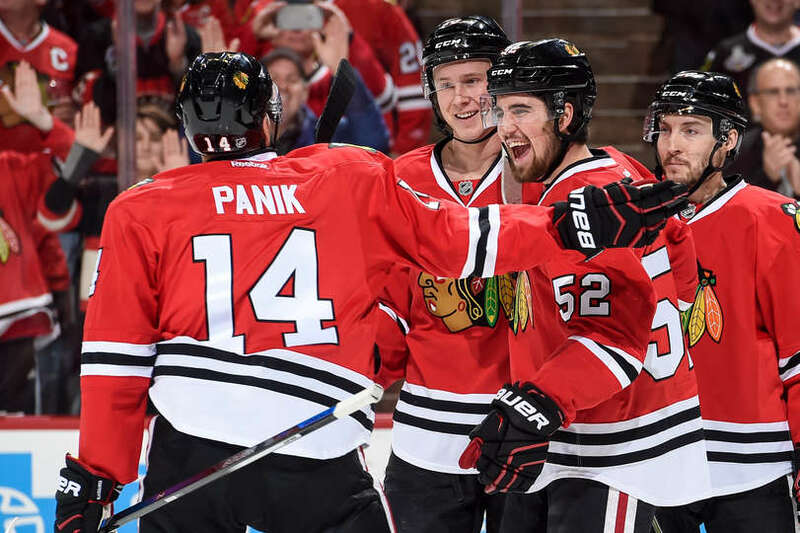 There are still 31 games remaining in the NHL season and the Blackhawks are in a good place atop the Conference. 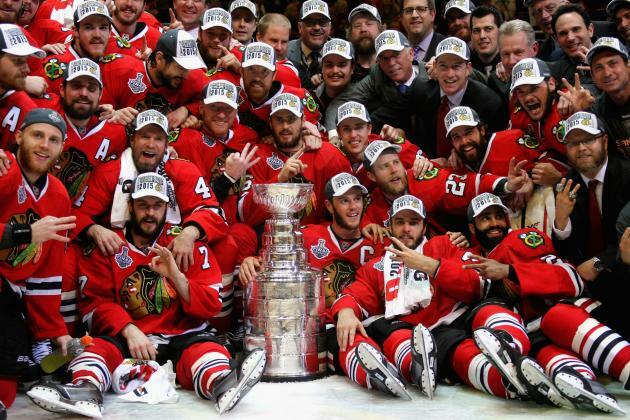 It's not important to be the top seed in the Conference, as the Blackhawks have proved that twice before (2nd seed in 2010), (4th seed in 2015). All you need to have, is enough points to get into the Road To The Cup that leads to the finish of the marathon. 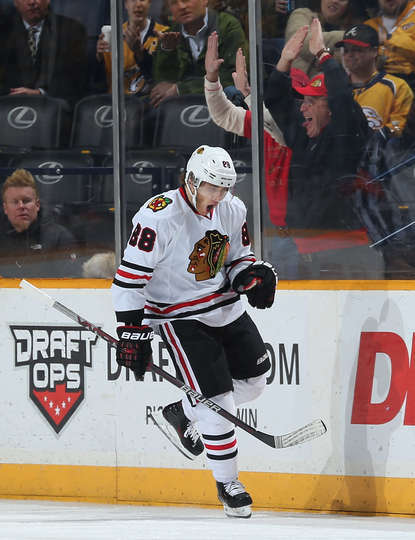 The Chicago Blackhawks set a franchise record that took 89 years in the making, as the Hawks won for the 12th consecutive time, beating the Nashville Predators, 4-1 in Music City. It was yet another goalie win as Corey Crawford stopped 38 of 39 shots. The game started with the Predators all over Corey Crawford leading in shots the first half of the period, 10-3, but would not dent the net. The second half of the period belonged to the Blackhawks. 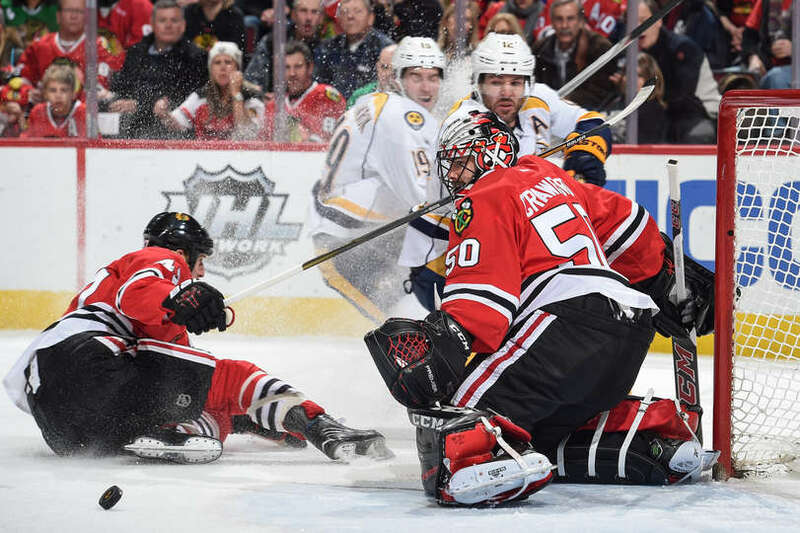 Artem Anisimov would put the Hawks on the scoreboard with a nice move as he went hard to the net and slipped a puck through the legs of Pekka Rinne with 21 seconds remaining in the 1st. The shots for the period would end, 12-10 in favor of Nashville, but the Hawks would lead, 1-0. The 2nd period continued with the Blackhawks getting pressure on Rinne. Richard Panik scored his 2nd goal in his 5th game with the Hawks as he wristed a shot that surprised Rinne that gave the Hawks a 2-1 lead. Then, :25 later, Ryan Ellis blasted a shot from the point that got through Crawford to bring the Preds to within 2-1. 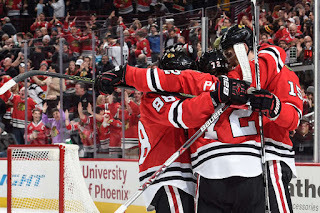 Exactly one minute later, Patrick Kane received a breakaway pass from Artemi Panarin and top-shelfed a shot over Rinne to put the Blackhawks up, 3-1. The scoring chances continued for both teams, but the period would end the period leading 3-1. In the 3rd, the ice was tilted towards the Blackhawks end the entire period. Corey Crawford was on his game...AGAIN...as the Preds outshot the Hawks, 16-5 in the period. 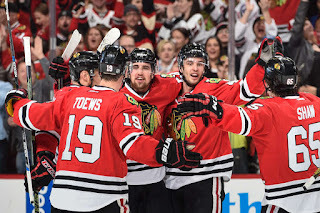 The only goal of the period, came with :37 left when Andrew Desjardins deposited the puck into an empty net to cap the scoring and a 4-1 Blackhawks victory. 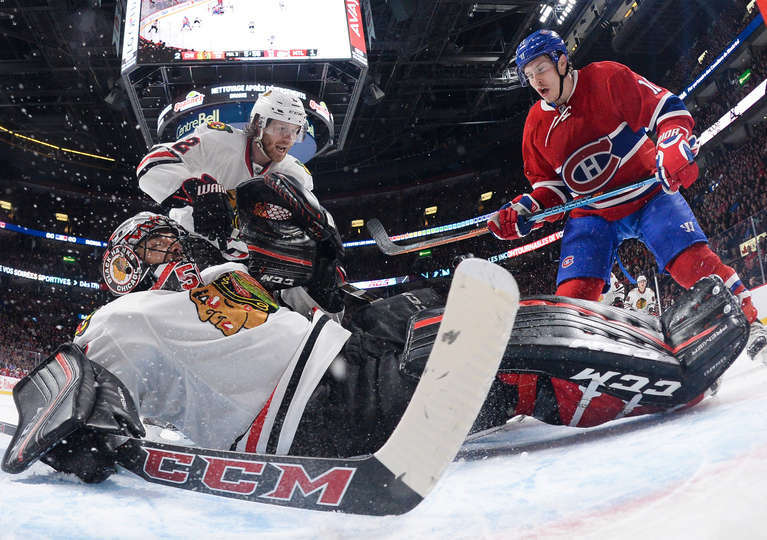 The Chicago Blackhawks and Montreal Canadiens played each other for the 2nd time in 4 days. Also, because of the stupid schedule, these two Original Six teams will not play one another for the rest of the regular season. Regardless, the Blackhawks tonight tied a franchise record by winning 11 straight games with a 5-2 victory over the Canadiens. Erik Gustafsson returned to the Blackhawks lineup after being out for a couple of games and he made his presence known early. After making two great outlet passes within the first 1:15, he then kept with a play and made a great pass to Richard Panik for his first goal as a Blackhawk to give the Hawks a quick 1-0 lead. Within 3 1/2 minutes, Lars Eller tied the game for Montreal after he picked up a rebound given up by Corey Crawford. The period would end tied with the Hawks holding the shot advantage, 10-6. The 2nd period saw both teams exchange power plays. One of those came as Marian Hossa took a stick to the face, this, after taking a stick to the face the last time these two teams met that required stitches. The Blackhawks cashed in on the power play to give the Blackhawks a 2-1 lead, as Jonathan Toews finished a pinball passing play from Hossa and Patrick Kane. With less than a minute remaining in the period, a debatable no call for icing resulted in Jonathan Toews's 2nd of the night, a wraparound goal to send the Blackhawks into the locker room with a 3-1 lead. The Canadiens poured it on in the 3rd and it took half the period and a Blackhawk penalty, but Max Pacioretty cashed in on a rebound attempt to bring the Habs to within 3-2. But just 1:55 later, Artemi Panarin made a pass to himself off the boards and back-handed a pass to Kane, who buried a one-timer to give the Blackhawks their 2 goal lead back, at 4-2. To top off the scoring, an errant pass by Duncan Keith to Marian Hossa wound up going into an empty net as the Habs had pulled the goalie. Notable mentions: The Blackhawks have tied their franchise record, 11 straight wins with their victory tonight matching the streak they had in the 2012-13 season. Patrick Kane scored his 29th goal tonight. One goal shy of his career high, Tonight was game 48 of the season. Jonathan Toews in his last 6 games has 9 points (5G 4A) and is +7. 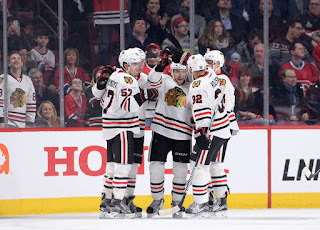 The top line continues to shine for the Blackhawks as Andrew Shaw, through a determined effort, passed the puck through the crease to Jonathan Toews, who roofed it to put the Hawks up 1-0, 8:26 into the period. Just over two minutes later, the Canadiens would tie the game on a weird, pinball bounce off a skate from Paul Byron and through Corey Crawford. 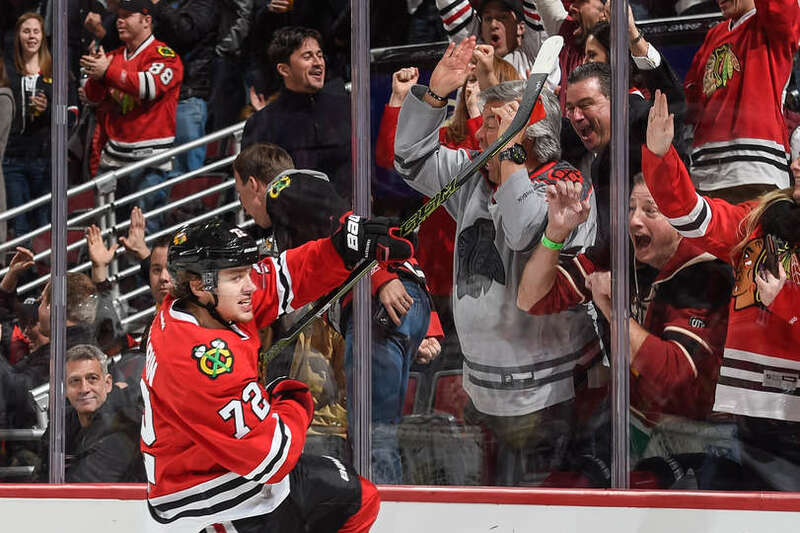 It would not last long as Ryan Garbutt scored his 2nd goal of the year, and Richard Panik earned his first point, an assist, as a Blackhawk as the Hawks took a 2-1 lead into the first intermission. In the 2nd, the Canadiens came at the Blackhawks like locusts and Crawford was there to swat them away. There was a barrage of three quick, difficult saves that would have tied the game at two, but Crawford said no. Rob Scuderi had a horrible 2nd period as every time he was on the ice, the Canadiens were attacking constantly. Thank goodness for Crawford. Scoring chance after scoring chance, but Crawford managed to escape the period without letting up a goal. The shots after two periods were tied at 23, but the scoring chances were close to 3-1 in favor of the Habs. The 3rd period saw both goalies making some very strong saves. During a Montreal power play, Marian Hossa took a stick to the face as he was killing a penalty. He would go off for repairs. Again, both teams would spend the 2nd half of the period trading scoring chances. In the end, it was Corey Crawford having one of his best games of his career, as he stopped 39 shots for the victory. 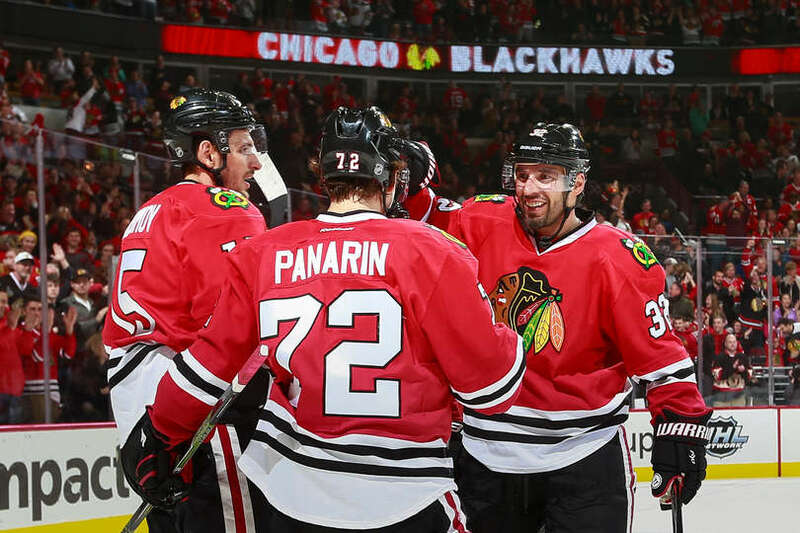 Notable mentions: Blackhawks are now 21-0-1 after leading after two periods this year. 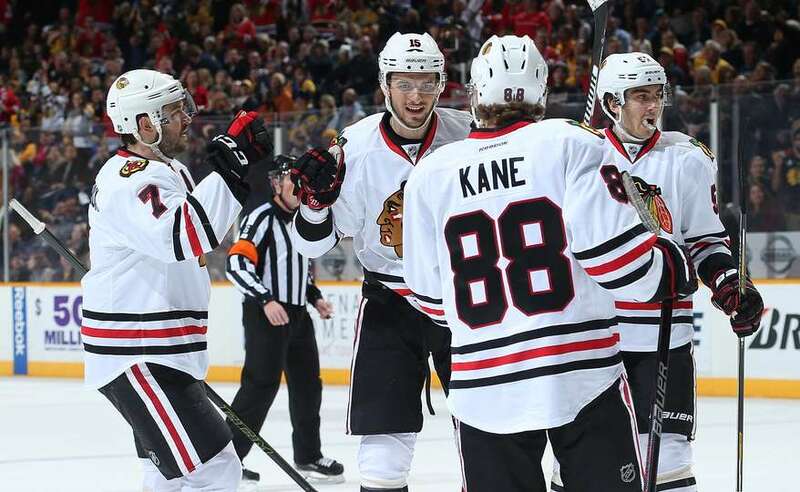 Patrick Kane was held off the score sheet for just the 7th time in 46 games this year. Ryan Garbutt's goal was his 5th game-winning goal in his career. 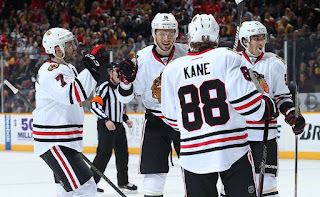 The Chicago Blackhawks played the 2nd half of a back-to-back, this time taking on the Toronto Maple Leafs. Patrick Kane recorded, amazingly, his first career, regular-season hat trick, and added an assist to help the Hawks to a 4-1 win for their 10th win in a row. The first period wasn't great for the Hawks, but no harm done. Scott Darling, getting his first start in 9 games, stopped all 10 shots in the period as the Maple Leafs outshot the Hawks, 10-7 in the period. The lone highlight was an overturned goal. 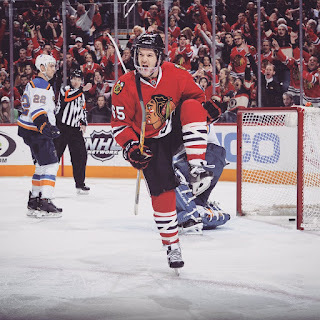 Andrew Shaw found the back of the net, but it was ruled that replay showed that Marian Hossa's foot was just offside. The period would end scoreless. In the second, Kane found a loose rebound in a scramble in front of the Maple Leaf net and slammed it past Toronto goalie, James Reimer, to give the Blackhawks a 1-0 lead. The Maple Leafs were called for 4 penalties in the period. Late in the period, the Hawks had a 5-on-3 for 1:53 thanks to a high sticking penalty that found the face of Kane. It didn't take long for the Hawks to cash in as Kane was fed a pass from Artemi Panarin, and buried it to help the Blackhawks head into the 2nd intermission with a 2-0 lead. The third period started where the 2nd left off. This time it was Panarin on the receiving end of a pass Kane pass on the power play, and the Blackhawks had a comfortable 3-0 lead. Roughly 3 1/2 minutes later, Morgan Rielly beat Darling with a wrist shot over his stick side shoulder to bring the Leafs to within 3-1. In the end it was the Patrick Kane show as Teuvo Teravainen fed Kane for his 3rd goal of the night, ending the scoring. Notable Mentions: Wins in Montreal (the night before) and Toronto tonight, was the first time the Blackhawks won back-to-back wins in those two cities since 1952. Scott Darling played well, as he stopped 28 shots for his 5th win of the year. With the win, the Blackhawks are now atop the Western Conference. The Chicago Blackhawks won their 8th straight win tonight as they took on their rival, the Nashville Predators at the United Center. 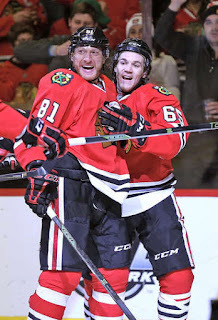 Andrew Shaw scored two goals, Marian Hossa, celebrating his 37th birthday, would add two assists. Corey Crawford stood on his head and stopped 41 shots and coach Joel Quenneville, after receiving a 3-year contract extension earlier in the day, won his 782nd career win as a Head Coach, tying him with Al Arbour for 2nd on the All-Time Win List, as the Blackhawks defeated Nashville, 3-2. Typical of a Blackhawks/Predators game, the first period was full of defense, a few scoring chances, but little scoring. Fortunately, the lone goal of the period came from the stick of Andrew Shaw. Marian Hossa streaked around the back o the net and failed on a wraparound, but Shaw was there to knock the rebound in to give the Blackhawks a 1-0 lead with :58 left in the period. Blackhawks held an 11-10 edge in shots. In the 2nd period, Corey Crawford made some strong saves, as he did in the first. One particular save snapped the top of his stick and was just enough to stop a Roman Josi shot in front of the crease. It took the Blackhawks till the 6:14 mark to get a shot on goal. All was well though because it was Shaw who deposited that shot into the back of the net for his 2nd of the night to make it 2-0, Blackhawks. Seven minutes later, Brent Seabrook did a give and go with Patrick Kane after a nice keep in by Erik Gustafsson and Seabrook buried a shot past Pekka Rinne to give the Hawks a 3-0 lead. Just :18 later Mike Ribeiro bounced a shot off of Crawford's pads from behind the net to get Nashville on the board to make it 3-1. The Predators threw 20 shots on Crawford that period, but the Hawks kept a 3-1 lead going into the 3rd. 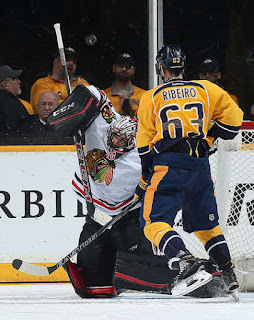 In the 3rd, the Predators peppered Crawford numerous times, but Crow was up to the challenge. With less than a minute left, and on the power play, Filip Forsberg threw a shot past Crawford to bring the Preds to within 3-2. A last rush was spoiled by Crawford to preserve the 3-2 win. Notable mentions: The top line has enjoyed success over the lsat few games. Andrew Shaw in his last 5 games has 5 points (2G 3A) and is a +7. 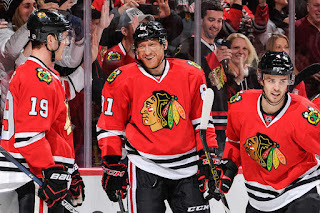 Marian Hossa in his last two games has 4 points (2G 2A) and is a +5. Jonathan Toews, in his last 13 games, has 15 points (7G 8A) and is a +15. The Blackhawks now play 9 of their next 12 games on the road. Let's hope their recent success helps out their road record (9-8-3). 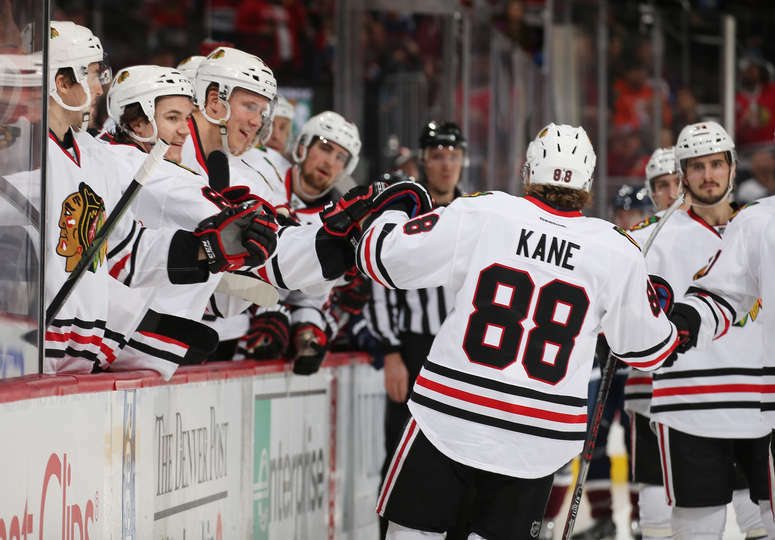 The Chicago Blackhawks exploded a barrage of goals on the Colorado Avalanche as Marian Hossa and Patrick Kane, both had 2 goals in a 6-3 win. The Avalanche started the game pressuring Corey Crawford and Crow was up to the challenge, stopping all 11 1st period shots. It took the Blackhawks 6 minutes to get their first shot. 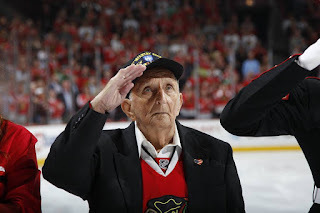 Dennis Rasmussen won a faceoff, Ryan Garbutt fired a shot at the net, and Brandon Mashinter pushed in a loose rebound in front of the net to give the Blackhawks a 1-0 lead. With less than 4 minutes remaining in the period, Kane wristed a shot past Semyon Varlamov, who was completely screened by Artem Anisimov. The period would end with the Hawks with a 2-0 lead, and a shot advantage of 13-11. It took the Blackhawks 1:39 to find the back of the net again when Hossa had an entire open net to work with after receiving a nice pass from Niklas Hjalmarsson to give the Hawks a comfy, 3-0 lead. That comfy lead did not last long as Matt Duchene snapped a wicked shot past up and over Crawford to bring Colorado to within 3-1. Four minutes later, Duchene, patient with the puck, caught Crawford leaning in the opposite direction and scored his 2nd of the night to make the score, 3-2. The game opened up after that. Chances for both teams, and it lead to a Blackhawks power play. Amazingly, the Avs let Kane walk right in the slot and snap a wrist shot, short side, to give the Hawks a 4-2 lead. Varlamov was then replaced in net for Colorado. Two minutes later, Jonathan Toews went top cheese on replacement Calvin Pickard to make it, 5-2, Blackhawks. 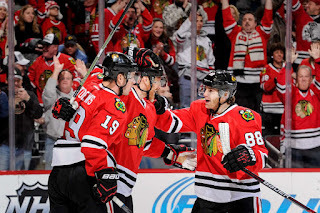 The period wound not end until Hossa scored his 2nd of the night to bust the game open, 6-2. Patrick Roy oozed into his players as Nathan MacKinnon took an Unsportsmanlike Conduct penalty after the 6th goal. The 3rd period...well...some would say it was boring. There was only one goal scored in the period and it was from MacKinnon as he snapped a shot from the slot past the glove of Crawford to make it, 6-3. Although again, both teams had great chances, the back of the nets were given the rest of the night off. Notable mentions: A number of pointless streaks were snapped tonight: Mashinter (5 gms), who hasn't played since 12/31, Garbutt (18 gms), Rasmussen (9 gms), Trevor van Riemsdyk (22 gms). 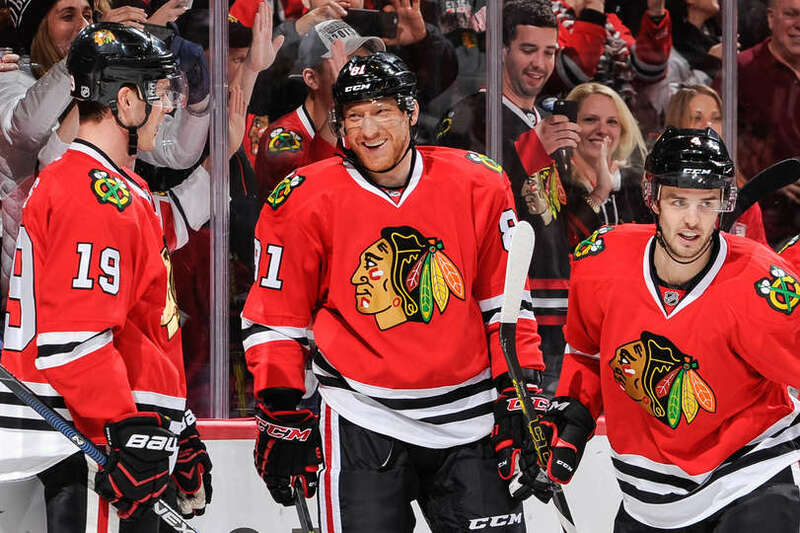 Marian Hossa also snapped a 14 game goalless streak. Joanthan Toews' goal tonight ties him for 11th with Patrick Sharp on the All-Time Blackhawks Goals List. He was also a +3 tonight which catapults him atop the Blackhawks All-Time +/- List, surpassing All-Time Great, Steve Larmer (+184). 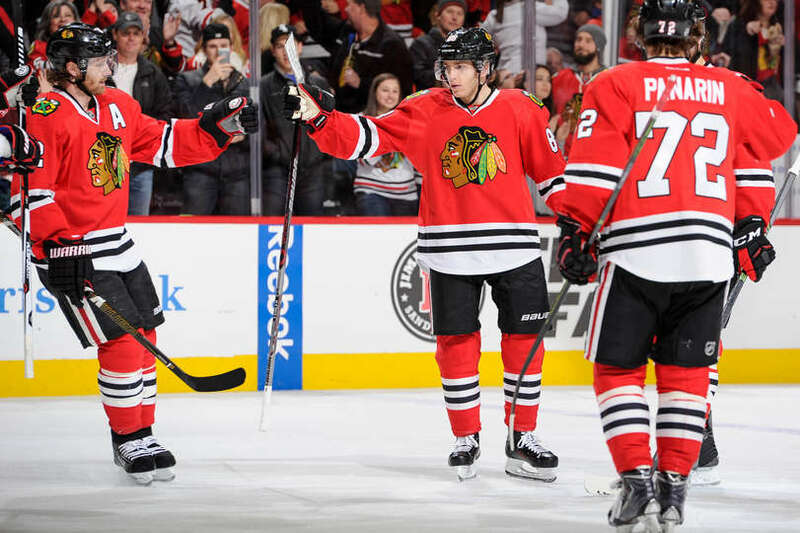 The Blackhawks are now only 4 points behind Division-Leading Dallas Stars. The Buffalo Sabres came into the United Center losing their last 5 games. The Chicago Blackhawks came into the United Center winning their last 5 games. Odds would favor the Blackhawks, no? Well, it did, as Phillip Danault scored his first NHL goal, which proved to be the game-winner, despite the great play of Buffalo goalie, Chad Johnson. Johnson stood on his head, among other things in the 1st period as the Anisimov-Kane-Panarin line were flying around the net like vultures. Of the 11 shots that the Hawks had that period, 5 came from the Anisimov line and 6 came from defensemen. One of those shots found the back of the net thanks to a Niklas Hjalmarsson wrist shot that finally solved Johnson who received a nice pass from Erik Gustafsson, with less than 2 minutes remaining in the period. The 2nd period began where the 1st ended. The Blackhawks had golden opportunities and Johnson rejected shot after shot. In the latter half of the period, the Sabres started to show life and it was Corey Crawford's turn to shine. He made a couple of great saves, including a huge one on a Buffalo power play. The Hawks would then start putting more pressure back on Johnson again, but he was up to the test as he shutdown the Hawks in the 2nd, stopping all 19 shots. At the end of two periods, the Hawks had a shot advantage of 30-23, and the 1-0 lead. The 3rd period found Johnson yet again denying shots. It took till the 12 minute mark of the 3rd for the Sabres to solve Crawford as Blackhawk nemesis, Ryan O'Reilly roofed a shot over Crawford to tie the game at 1. With 5 minutes left, it was Phillip Danault, who has been playing great from his call up, scored his first career NHL goal to give the Hawks a 2-1 lead. 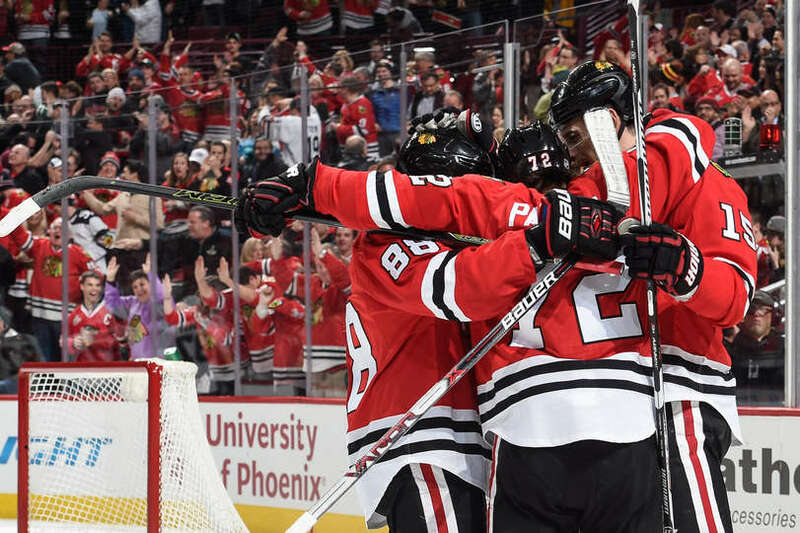 It proved to be the game-winner as Jonathan Toews ended the scoring with an empty net goal to help the Blackhawks win their 6th game in a row. 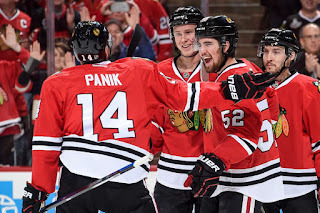 Notable mentions: The two Blackhawk rookies, Phillip Danault and Erik Gustafsson had great games. Both showed up on the scoreboard and had solid games. Jonathan Toews now has 11 points in his last 11 games (6G 5A). Duncan Keith now has 21 points in his last 22 games (5G 16A). 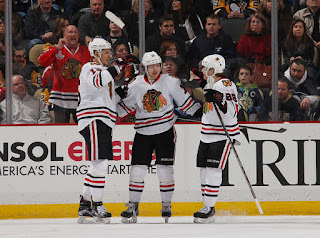 The Chicago Blackhawks and the Pittsburgh Penguins met again Wednesday night, the 2nd half of a home-and-home series. This time, the stage was the United Center. The star, the same as it was last night, Artemi Panarin who scored two more goals again tonight to give the Hawks a 3-1 win. The Blackhawks came out blazing by peppering Marc-Andre Fleury with 15 shots in the first period while the Penguins managed just 3 shots on Scott Darling and the Blackhawks. Puck possession was obviously what the Blackhawks had in mind as they put on a clinic keeping the puck in the Pittsburgh zone for close to a full minute. It ended with Artemi Panarin whipping a snap shot off of Fleury thanks to the net presence of Artem Anisimov who screened the shot. The period would end with the Blackhawks with a 15-3 shot advantage and a 1-0 lead. In the 2nd, Pittsburgh would tie the game when Evgeni Malkin would slap a shot past Darling while on the power play with Patric Hornqvist screening Darling the entire time all alone in front of the net. The Hawks had plenty of scoring chances again on Fleury, but Fleury answered them all in the period including an outstretched pad save on Trevor van Riemsdyk. The period would end, 1-1, with the Blackhawks shot advantage at 25-11. 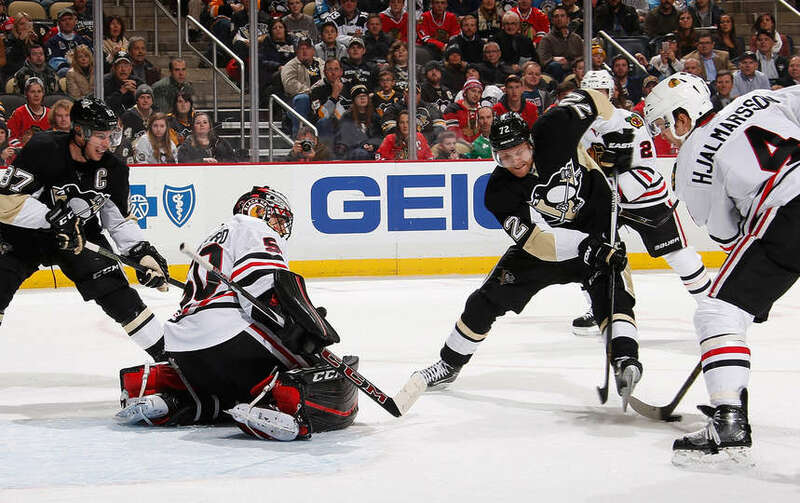 Fleury continued his dominance in net as he started the period rejecting a Jonathan Toews redirected shot. 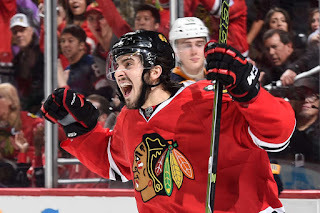 With the game almost half over, Panarin scrapped for a loss puck off of a faceoff and the Breadman struck yet again with a wicked wrist shot to give the Hawks a 2-1 lead. The Penguins only mustered 18 shots for the entire game against Darling who picked up his 4th win of the season. Late in the period, Kris Letang took a classless run at Panarin to deny him a chance for his first NHL hat trick. And as any good Captain would, Toews took exception to it. Panarin would have another chance before the game ended but missed wide by two feet. Notable mentions: Marc-Andre Fleury played well to win both games in this home-and-home...but he didn't. 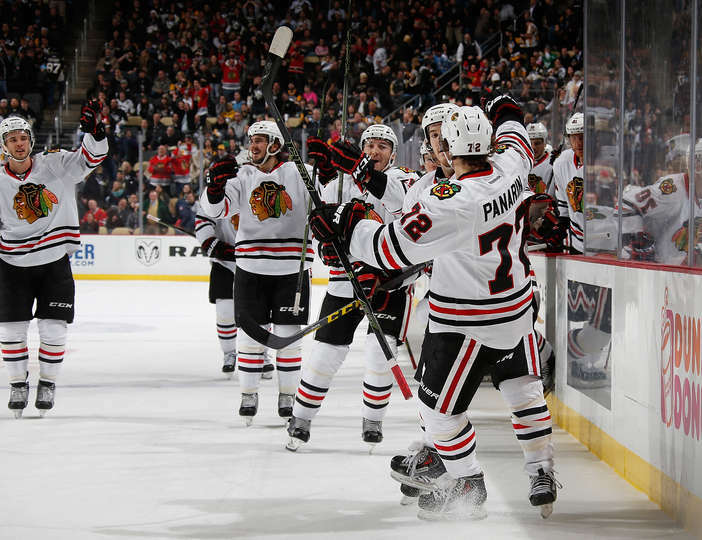 Artemi Panarin outscored the Penguin team over the last two games, 4-3. He now has 38 points (15G 23A), 10 points ahead of any other rookie. Patrick Kane's assist tonight gives him a 5-game point streak (2G 8A). 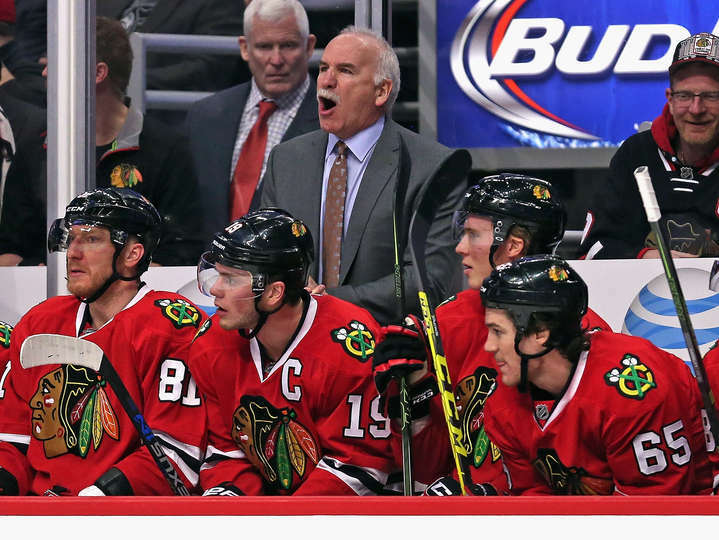 The Blackhawks are now just 6 points behind the Dallas Stars for best record in the conference. 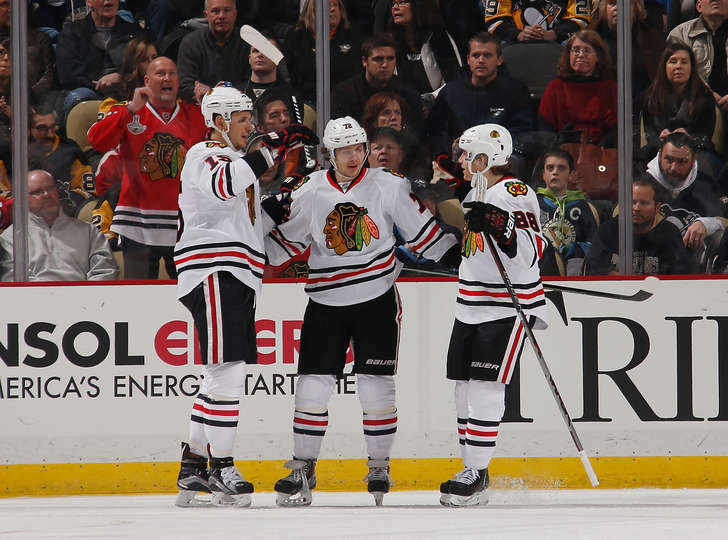 Blackhawks Escape with Overtime Win In Pittsburgh, 3-2. Whose idea was it to play 3-on-3 in overtime? The Chicago Blackhawks and Pittsburgh Penguins put on a heart attack clinic tonight as they skated into overtime tied at 2. In the end, Artemi Panarin, 'The Breadman' deposited a shot over Penguin goalie, Marc-Andre Fleury, in what we would like to call 'The Breadbasket' to give the Blackhawks a 3-2 overtime win. The game was dominated by Pittsburgh for most of the game. It was the play of Corey Crawford that kept the Hawks in the game and also in overtime. It was a goalie win tonight. The first period was fast paced and did not have a lot of whistles. Both teams played the puck possession game and both teams had good chances, but the goalies denied any goals as the period ended scoreless. In the 2nd, Pittsburgh started to tilt the ice to the Blackhawks end and peppered Crawford with 14 shots throughout the period, but Crawford stopped them all. The rest of his team did not help much as they turned over the puck and played sloppy continuously throughout the period. During a pressure-filled sequence, the Penguins pinched in too close as the Hawks wound up with a 2-on-1 chance with Patrick Kane and Panarin. It doesn't take much to know what happened next. Kane saucered a pass to the Breadman who slapped a one-timer just beyond the reach of Fleury to give the Hawks a 1-0 lead. At the end of the period, Brent Seabrook sent a slapshot toward the net that bounced off of Jonathan Toews in front and across the goal line to put the Hawks up 2-0 at the end of two periods. As the 3rd started, one knew that the Penguins would be putting their jets into overdrive to get back into the game that they had controlled for most of the game. It took just under 6 minutes, when Sidney Crosby snapped a shot over the right shoulder of Crawford to put Pittsburgh on the board at 2-1. On Crosby's next shift, he almost tied the game with a backhand shot that beat Crawford over his right shoulder again, but this time found the goal post. Kris Letang would get the equalizer with just under 3 minutes left to tie the game and force overtime. Overtime consisted of 5 shots a piece as each team had golden opportunities. For over 3 1/2 minutes, both teams raced back and forth blasting shots and both goalies, repelling them away. 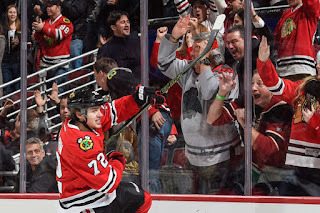 It took Panarin to finish off the chaos and bring everyone's blood pressure back to normal as the Hawks escaped with not just 1 point, but 2, in a night where they could have easily have come up empty if not for Crawford. That was so much fun, can't wait for the rematch.....TOMORROW at the United Center. Notable mentions: With tonight's win, the Hawks leapfrog the St. Louis Blues for 2nd place in the division with a game in hand. Toews' goal tonight gives him points in his last 5 games (3G 2A) and 7 of his last 9 games (5G 4A). Panarin's 2 goals tonight gives him 5 points in his last 4 games (4G 1A). 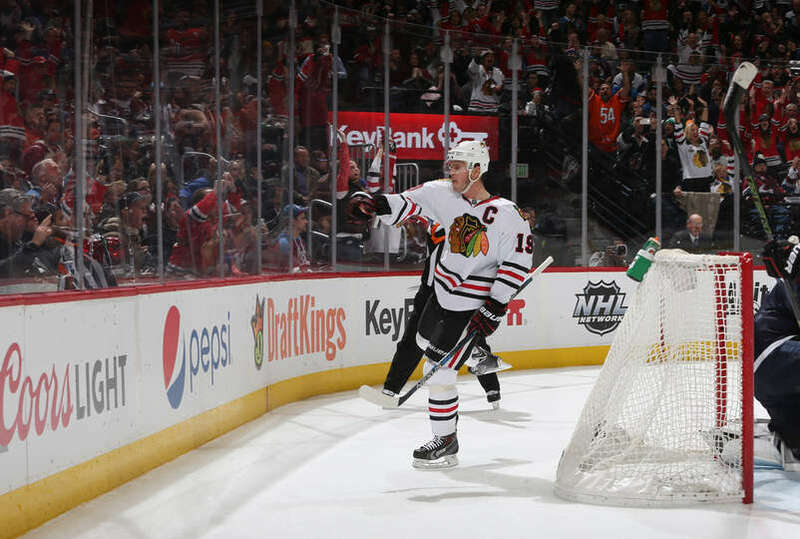 Jonathan Toews has many nicknames, but the one that fits him best has to be Captain Clutch. Toews scored a power play goal in overtime as the Chicago Blackhawks beat the Colorado Avalanche 4-3 Friday Night. It was his fourth overtime game-winner...this year! The game started where the previous game left off; a Blackhawk penalty within the first 4 minutes of the game. Within 18 seconds, Carl Soderberg scored on the power play to give the Avs a quick, 1-0 lead. The Hawks did not have a good period, but fate would be on their side when Artem Anisimov took a pass from Patrick Kane and waited before snapping a shot past Colorado goalie, Semyon Varlamov, to tie the game with less than 2 minutes remaining in the period. The 2nd period saw, new scoring sensation, Andrew Desjardins, redirect a shot into the net for his 3rd goal in his last two games, to give the Blackhawks a 2-1 lead at the 2:07 mark. Blake Comeau tripped Kane two minutes later. 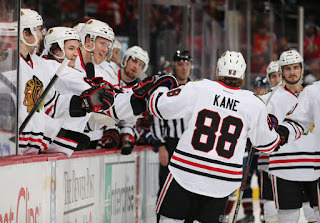 Kane then made him pay as 22 seconds after the start of the power play, Kane did a give and go with Artemi Panarin and Kane received the pass back and snapped a wrist shot behind Varlamov to extend the lead to 3-1. Half way through the period, Cody McLeod wristed a shot from just within the Blackhawk blue line and somehow made its way past Hawks starting goalie, Scott Darling, to bring the Avs back to within 1 goal at 3-2. Other than that goal, the Blackhawks dominated that period by out-shooting Colorado, 17-5. In the 3rd, Erik Johnson went through three Blackhawks and flipped a shot that squirted through Darling with less than 5 minutes remaining in the game to knot the game at 3. It would take overtime to decide the fate of this game. Colorado got called for too many men on the ice half way through the overtime giving the Blackhawks a power play. They would cash in again on the power play, they went 2 for 6 on the night. Some would say it's not fair to have a power play unit of Toews-Kane-Panarin-Keith, but most of us would not see a problem with that. Toews received a pass from Kane and when he turned toward the net, he was all alone and beat Varlamov, short-side, for the game-winner. 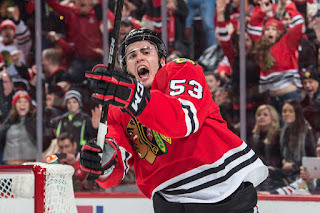 Notable mentions: Artem Anisimov's 1st period goal was his 100th of his career. That goal also was the first for the Hawks against Varlamov this year in almost 4 periods. Varlamov is now 11-4, lifetime against the Blackhawks. Andrew Desjardins now has 4 goals this year. He is one goal away from tying his career high in goals. LET'S GO HAWKS AND HAPPY NEW YEAR!! !